Becoming an Advanced Practice Registered Nurse (APRN) in the role of the Clinical Nurse Specialist (CNS) is a transformational experience. 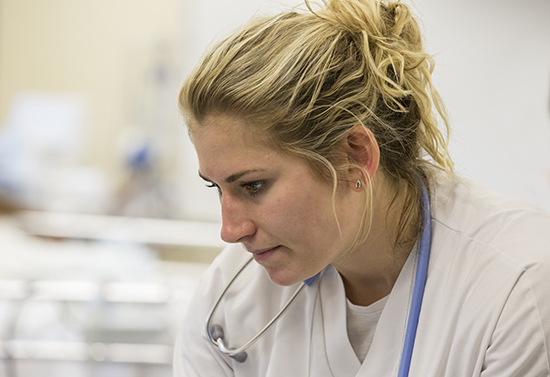 Students develop clinical expertise, lead nursing care and make real change happen at the bedside and in the boardroom. They can speak concisely about the importance of their role. They know the outcomes of CNS practice. They know those outcomes are critical to the viability of healthcare systems today and they know the CNS role is essential. Our students experience the full breadth of the CNS role as a prescriber, coach for patients and staff, team builder and change agent, while improving quality of care and the bottom line for healthcare systems. Our students take the role across healthcare settings from acute to non-acute care. Our graduates know who they are when they graduate and are practice-ready. Our 2016-2017 graduates have achieved a 100 percent pass rate for the national certification exams for the Adult-Gerontology CNS through ANCC (non-acute care CNS), AACN (critical care CNS) and ONC-C (oncology). The Detroit Mercy experience is transformational. In addition, 100 percent of graduates are employed in CNS roles, care coordination, academia and across settings to include telemedicine. CNSs saw the highest pay spikes among APRNs in 2017 up to $102,000, which is a 7.4 percent than 2015 (Medscape APRN Compensation Report 2017). We have a dynamic group of CNS faculty willing to spend the time it takes to make your experience at Detroit Mercy the best it can be. We know graduate studies are an important aspect of your lives and that life continues to move forward in unexpected ways. As a result, our faculty maintain an atmosphere of rigor with flexibility and will work diligently with any student who needs extra support. Students choose their pace. Our students say great things about their Detroit Mercy experience. That is the Detroit Mercy way. We look forward to helping you transform your life and career! The program is taught on-line in a flexible and student-centered format with course and faculty availability seven days a week. Students need not be a resident of Michigan to be in the program. Clinical sites and qualified preceptors are identified near the student's home to complete the required clinical component in the role of the CNS. Upon completion of the Post-Master’s certificate, the nurse will be eligible to sit for the examination for the Adult-Gerontology Clinical Nurse Specialist certification through the American Nurses Credentialing Center or the American Association of Critical Care Nurses. Our graduates achieve great careers. One-hundred percent of Detroit Mercy AGCNS graduates are employed in CNS roles, care coordination, academia and across setttings to include telemedicine. CNSs saw the highest pay spikes among APRNs in 2017 up to $102,000, which is an increase of 7.4 percent over 2015 figures (Medscape APRN Compensation Report 2017). The 2016-17 Detroit Mercy graduating class achieved a 100 percent pass rate across the national certification exams for the Adult-Gerontology CNS through ANCC (non-acute care CNS), AACN (critical care CNS) and ONC-C (oncology). "I passed the ACNS (first try), I was so well prepared by the program." "You have a terrific program with great support staff. It is very cohesive and collaborative." "The CNS is a champion for quality patient care. We are APRNs with graduate preparation, sharing the same core courses as NPs (A&P, patho, and pharm). However, our focus is not only providing diagnosis, treatment, and ongoing management of patients, but also using our nursing expertise to support the work of the nurses at the bedside and advancing our practice by being the voice of nursing in the boardroom. We also function on the systems level by initiating research, quality improvement, cost saving strategies, and implementation of evidence-based practice,"
"A CNS is an advanced practice nurse who specializes in a patient population or clinical area to be a champion of evidence based practice, high-quality care and patient outcomes. We work across three spheres (the system, nurse and patient) to ensure the system is set up so it is easy for the nurses to do the right thing every time and thus provide high quality care to patients to give them the best outcomes. We are master collaborators and agents of change,"
"One aspect of my role is to bring evidence-based practice to patients through direct care, the nurses or leading projects. I focus on quality and safety, clinical care issues like readmissions, errors, new technology, nurse and patient education and satisfaction. I analyze the metrics on a regular basis and communicate how we are doing or what needs more work,"